In the tradition of the ICFT, a full day, mid-week, is reserved for a social break to take in the local landscape. The historic village of Lunenburg has been selected to represent Nova Scotia’s rich maritime culture and traditions. ICFT local organizers are pleased to offer an escape to this treasured, east coast destination. Cruise the beautiful Lunenburg waterfront, explore Nova Scotia’s unique folk art tradition, take in picturesque, colonial façades, visit the Fisheries Museum of the Atlantic, or join a pre-arranged whale watching tour. 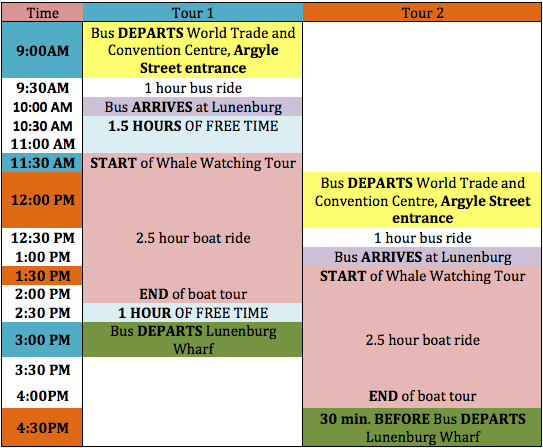 Travel to and from Lunenburg is arranged. Tour 1 departs at 9 a.m; Tour 2 departs at noon on Wednesday July 15. Register for Tour 1 (departing at 9 a.m.) or Tour 2 (departing at noon) at the ICFT Information Desk beginning Monday July 12. Whale Watching is optional! You’re welcome to wander for the duration of the tour. If you are registered for the conference, but have not signed up for the visit to Lunenburg and wish to do so, please contact Natalie Gomes (icft@agendamanagers.com). Cost is $75 to all ICFT delegates. Please be on time for your scheduled departure back to Halifax; a taxi from Lunenburg to Halifax will run you ~$200! * Please note the drop-off and pick-up locations for buses. Lunenburg was settled as a British colonial port town in the mid-18th century and quickly developed from an agrarian settlement to a major shipbuilding hub during the growth and eventual peak of commercial fishing off of Canada’s east coast. Under then-British policy, the town was developed in a sharp grid with north-south streets at crisp right angles to their east-west intersections. This convention of building “model settlements” resulted in harrowingly steep streets from the Lunenburg waterfront, but uniform plots on which over 70 per cent of the town’s buildings still remain part of the original 18th and 19th century construction. Until the early 20th century, the town was defined by the rapidly growing commercial fishery and the exploitation of many NW Atlantic fish species, notably Atlantic cod. With the arrival of steamships, wooden fishing vessels found new purpose as racing schooners, participating in international races while still hauling commercial harvests. The most famous Canadian racing schooner, Bluenose, was built in Lunenburg in 1921 and became a celebrated racing ship (inducted into the Canadian Sports Hall of Fame in 1955) and Canadian cultural icon in the 1930s until her wreck on a reef off of Haiti in 1948. For 17 years, she remained undefeated for the International Fishermen’s Trophy. Bluenose is portrayed on the Canadian ten-cent coin. A replica of Bluenose, Bluenose II, is under restoration in Lunenburg and receives tours during the summer months. Canada’s east coast is defined by unique port settlements, colourfully painted and decorative façades, and of course, warm hospitality. Lunenburg has remained one of the most well preserved original settlements in North America. The town received National Historic Property status in 1991 and was named a UNESCO World Heritage Site in 1995.